"Sampath Speaking" - the thoughts of an Insurer from Thiruvallikkeni: Bharat Ratna to Sachin Tendulkar and Prof. C.N.R. Rao - some differing thought !!! Bharat Ratna to Sachin Tendulkar and Prof. C.N.R. Rao - some differing thought !!! Today Test no.2102 ended on the 3rd day with WI losing the match by an innings and 126 runs…. Cheteshwar Pujara and Rohit Sharma scored centuries … Pragyan Ojha with 10 wickets was the Man of the Match. Shillingford took 5 …………. But none of these would be remembered as this became the final match of the legend Sachin Tendulkar who made a stroke-filled 74 and bade adieu to International Cricket. Sure, with - 34357 International runs; 201 wickets and 256 catches – Sachin has excelled in every possible manner and to think that Indian Cricket will have Sachin no more is sad.. the presentation ceremony centered entirely around Sachin, who made an emotional farewell speech……….. he was presented with mementoes ~ strangely one from Sri Lankan Government as well…. Well, celebrating his achievements in Cricket field is befitting………. But soon come sthe news that Sachin Tendulkar becomes the first sportsperson to receive the country's highest civilian honour. The Govt. has announced that he is bestowed the highest civilian award. Bharat Ratna will also be conferred on eminent scientist Prof C.N.R. Rao who is also a well recognized international authority on solid state and materials chemistry, an official statement said here. A living legend, Sachin Tendulkar has inspired millions of cricket fans across the globe. During the last 24 years, since the young age of 16 years, Sachin has played cricket across the world and won laurels for India. 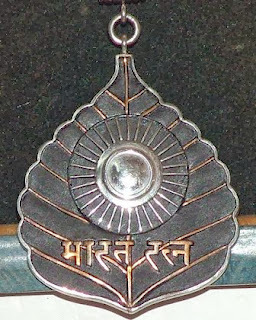 But I personally do not feel that this is Correct ~ I have been a great fan of his game but still…..
BHARAT RATNA translate to Jewel of India or Gem of India – is the highest civilian award given for highest degrees of national service, which includes artistic, literary and scientific achievements as also recognition of public service of the highest order. Whilst those knighted become “Sir”, the recipients of BR do not carry any special title but they certainly have a place in the Indian Order of Precedence. This is an award established on 2nd Jan 1954 by the First President Rajendra Prasad – the awarding of BR was suspended briefly from 13th July 1977 to 26th Jan 1980. Thus far, 41 have had the honour conferred on them - which includes two non-Indians and a naturalized Indian citizen. Though there was no allowance for posthumous awards in 1954 (Mahatma Gandhi was never awarded this). Legendary freedom fighter Nethaji Subash Chandra Bose was awarded in 1992 but was later withdrawn to a legal glitch in accepting his death. CM of Tamilnadu, cine actor MG Ramachandran was conferred Bharat Ratna posthumously. Perhaps ordinary people like us can never understand the conferrment on Khan Abdul Ghaffar Khan (1987) and Nelson Mandela (1990). 11 persons have been awarded this after their death – recognition after their passing away. Apart from Vinobha Bhave, Jayaprakash Narain and Dr BR Ambedkar, rest were all connected with political field. Abul Kalam Azad was given this award posthumously in 1992, though he passed away in 1958. Chakravarthi V Rajagopalachariar was the first recipient in 1954 and alongside there are 41 persons – 22 have had political careers. There are many very eminent persons like Sir CV Raman, Sarvepalli Radhakrishnan, the great Civil Engineer and architect Visvesvarayya, Industrialist JRD Tata, Hon’ble Abdul Kalam. There are people like economist Amartya Sen and there are musicians like MS Subbulakshmi, Bismilla Khan, Bhimsen Joshi, Ravi Shankar and Latha Mangeshkar. Film director Satyajit Ray also got this award in 1992. Prof. Rao has published over 1,400 research papers and 45 books. Prof. Rao's contributions have been recognized by most major scientific academies around the world through conferment of memberships and fellowships. He has been honoured with several national and international awards. Chintamani Nagesa Ramachandra Rao, also known as C.N.R. Rao (born 30 June 1934), is an Indian chemist who has worked mainly in solid-state and structural chemistry. He currently serves as the Head of the Scientific Advisory Council to the Prime Minister of India. Rao is one of the world's foremost solid state and materials chemists. He has contributed to the development of the field over five decades. Ideally, Bharat Ratna and such great National awards should embellish those who have done yeomen service to the Nation building or had created deep impact in the lives of people by their findings or by their way of life. This should apply not only to Bharat Rathna but to Padma awards given every year – the Padma Vibushan, Padma Bhushan and Padma Shri. In our Nation however there has been the popular trend and fashion whence you would find cine actors and others of entertainment sharing the podium brushing shoulders with great scientists, social workers and industrialists. Actors and entertainment artists would share or perhaps receive more glare than Scientists, Doctors, Social reformers and those who have contributed everything to their society. Popularity should not be the key to conferment of awards, nor should the Govt get swayed by emotions…. Recognition should be for people who have changed the lives of people and worked in Nation building. Though we love it – Cricket is only a game – a game played by a handful of Nations….. Spare a thought for those who have excelled in other sports too - some have brought laurels by winning Olympic medals and many have kept Nation's flag flying... Indian Cricket team in someways is representative of BCCI and not of the Nation. Nation need to honour, respect and model their lives on the lives of great people. The definition is very relative and whom you have role model, would impact the future generation. I fully agree. I am also a great fan of Sachin. But Bharat Ratna?..... i.e taking it too far. Prof CNR Rao and SRT in the same breath? Unacceptable. cricket knoweledge, leave it the man continously playing cricket for past 24 years,nobody playing like that so we have to hanour this way this is not mistake. S.ANBUCHELVAN.NAMAKKAL. The game of cricket is not a top notch one internationally and is played only by a handful of nations ! Honoring a cricket player with the country's top civilian award is too much that patriotic Indian can bear. The country has seen top notch sportsmen like Dhyan Chand, Milka Singh and even contemporarily Dhanraj Pillai and their contributions are far more greater than that of cricket and cricket players. It is okay sportsmen are honored with Arjun Award and Rajiv Khel Ratna Award. Country's civilian honors should be reserved and bestowed only to outstanding men and women who contribute to the society at large.